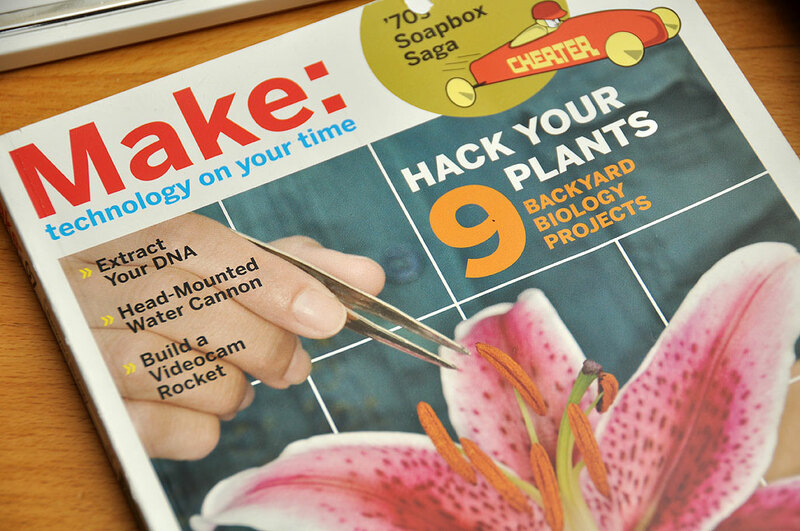 Back in the beginning of the year, we started a new topic called Backyard Biotech for the RainyDayScience section of the magazine. The interns did some research and quickly realized there was a growing movement of DIYBio enthusiasts on the Net. This is a group of DIYers, tinkerers, and curious individuals (very similar to the early days of computer hackers) interested in playing around with DNA, building thermocyclers, hacking the genome. So, for the better part of this week, we’ll be showing you what we’ve learned, what we would like to do, and where we are going with this. One of the interns’ tasks was to come up with a list of projects. The #7 issue of MAKE magazine made their task ridiculously easy. The first thing before doing anything else is to build a lab, and the first piece of equipment for any biotech lab is a microscope. OK, maybe the first thing is a decent workbench, but we already have one…so we started with the microscope. We have looked at digital microscopes (QX5, Brando) before, but we wanted a unit small enough for the field kit that we are assembling. 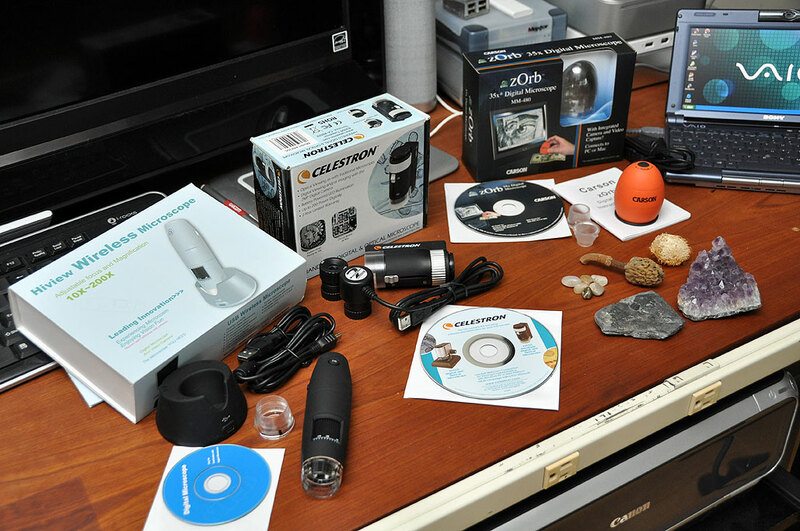 The field kit will have a digital microscope, a computer, and various specimen collecting gear. 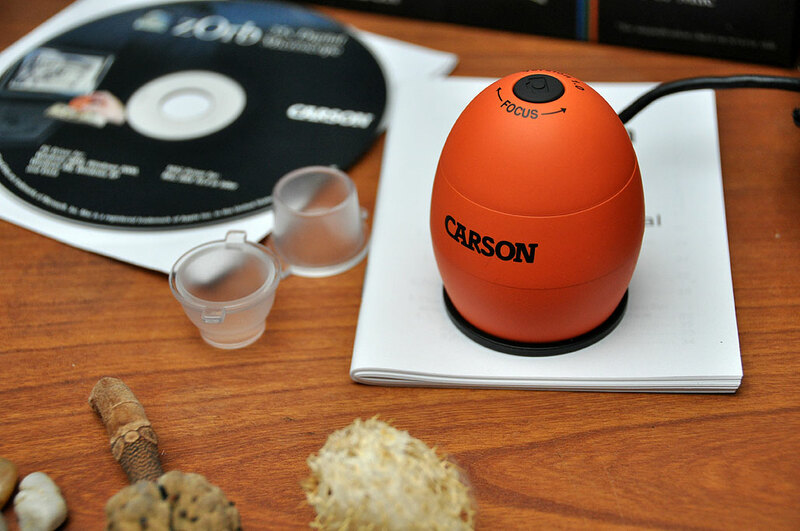 The Carson zOrb is the smallest of the three units. It is shaped like an egg, comes in some pretty cool colors, and is supported on both the Mac (OSX 10.4 and later) and the PC (Win98-Vista). The unit gets it power via the USB 2.0 connection with the computer. All of its exposure and white balance settings are automatic, but may be adjusted via software. The sensor is a 350K CMOS chip capable of capturing both stills and videos at VGA (640×480) resolution at 35X magnification. We like the design of the zOrb. The egg shape is comfortable to hold. At 104 grams it is very light. The controls are intelligently placed and simple to use: the shutter button is at the top, the focus is adjusted by turning the top of the “egg.” There are four LEDs at the base of the zOrb for illumination. It comes with two adapters for directing the light. There is also a CD with all of the software and drivers needed to run the zOrb. 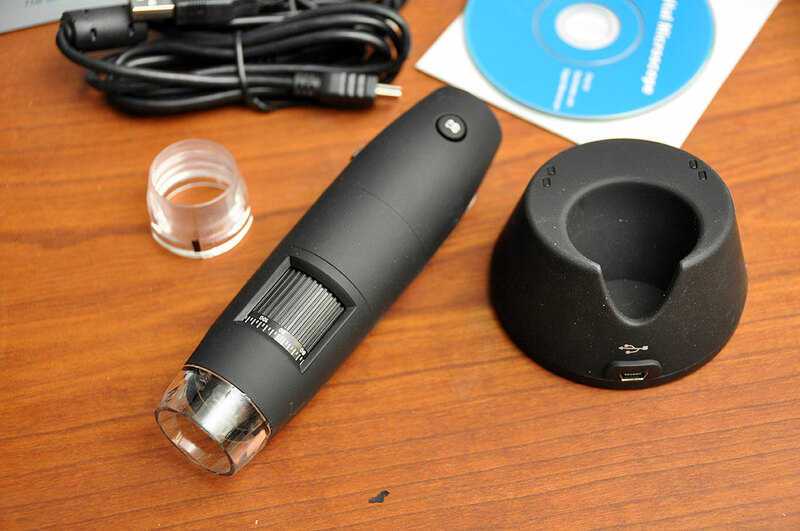 The HiView hand held digital microscope is the most mobile of the three. We picked it because it was the only wireless unit on the market. The idea of a wireless microscope makes a lot of sense. There are no cables to tangle, nor is the range limited to the length of the cable. This feature can definitely come in handy out in the field. The size of the HiView unit is obviously bigger (135mm) and heavier because of the battery (Li-ion). In fact, it is the biggest of the three. On the plus side, the battery is strong enough to enable the wireless microscope to transmit images to the computer from 15 feet away. There are four channels to choose from, which should make available a clear frequency if other 2-4GHz devices are in the vicinity. The scope has a magnification range of 10X to 200X. The image sensor is similar to the zOrb at 350K pixels, but it has a higher stated image resolution of 720×480. It has eight LEDs at the base for illumination. Focus, lighting, and image capture controls are all integrated in the barrel of the scope. The one annoying thing is that this is PC only. We may be able to find a Mac driver for it, but the mini-CD (another annoyance) only has drivers for XP and Vista. The last of the three is from Celestron. This unit is different from the other two in that it has both optical and digital capabilities. We also like it because it is very compact (89 mm, 57g), even when including the eyepiece and the 2MP (1600×1200) CCD sensor. The unit gets heavier when the two AAA batteries (for powering the LEDs) are installed, but not as heavy as the HiView unit. Like the zOrb, the Celestron will work on both the Mac and the PC, but the ArcSoft program which comes with the unit will only work on the Windows platform. 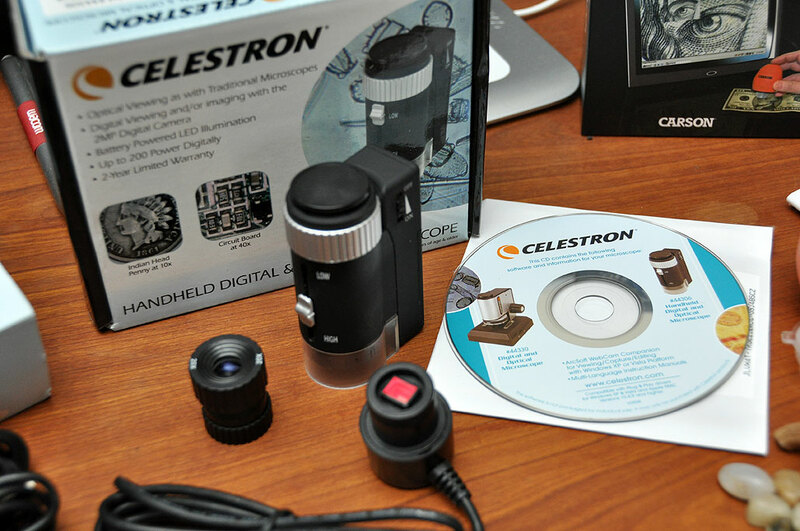 The Celestron, with its optical and digital options, removable batteries, and higher resolution CCD, does appear to be the most capable of the three. However, it has more plastic, pieces, and ways for dust to get into the unit. So it may be the least durable of the lot. Of course, we won’t really know until we put it to the test. All three digital microscope have their pluses and minuses. In the next installment of this series, we’ll take a FirstUse look at these three scopes. We’ll be evaluating them on performance, ease of use, and Mac/PC compatibilities. One of these scopes will make it into our field kit. The other two will have to stay behind, but no worries, they will still get to contribute to the Backyard Biotech project.